These plywood projects go pretty quickly. I had the cabinet glued up last night. 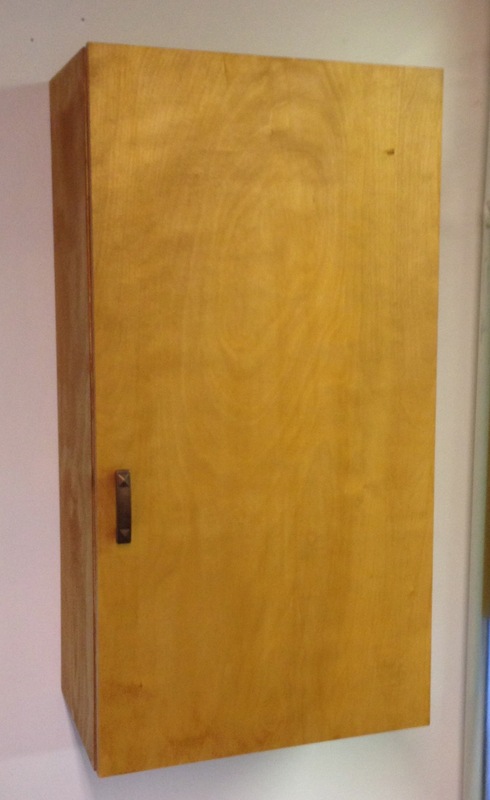 Today I just had to sand the outside, make a door, brush on some shellac and hang it. 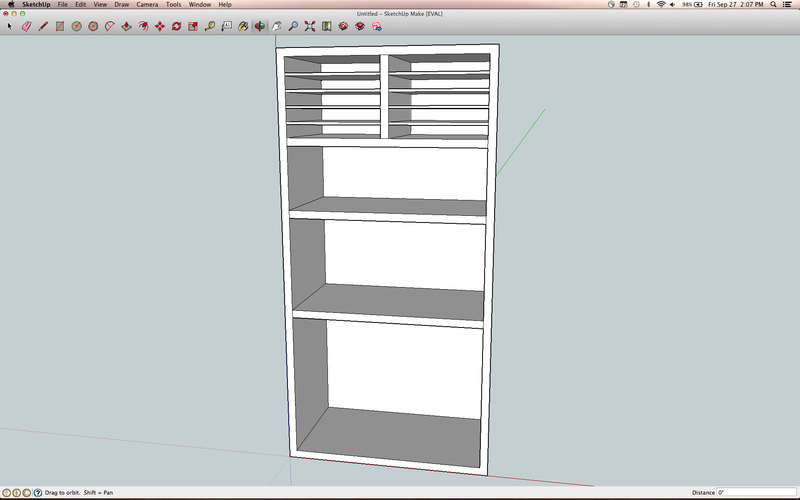 I did have to run to Home Despot to get some 1/8″ MDF for the dividers for the sandpaper cubbies. I had a moment of panic while driving back from the HW store. I’d drawn up the cabinet with a 1/2″ vertical devider between the sandpaper cubbies, but when I was making it I substituted 3/4 ply because two 1/4″ deep grooved back to back in 1/2″ ply (for the dividers) wasn’t going to work out in real life. So I was sure I’d made the cubbies too small to fit the sandpaper in — but I’d allowed enough space after all. False alarm. Not a lot to this project, but it will make the shop neater and more fun to work in. And I had a productive weekend, so I’ll be ready for the glass when it arrives. 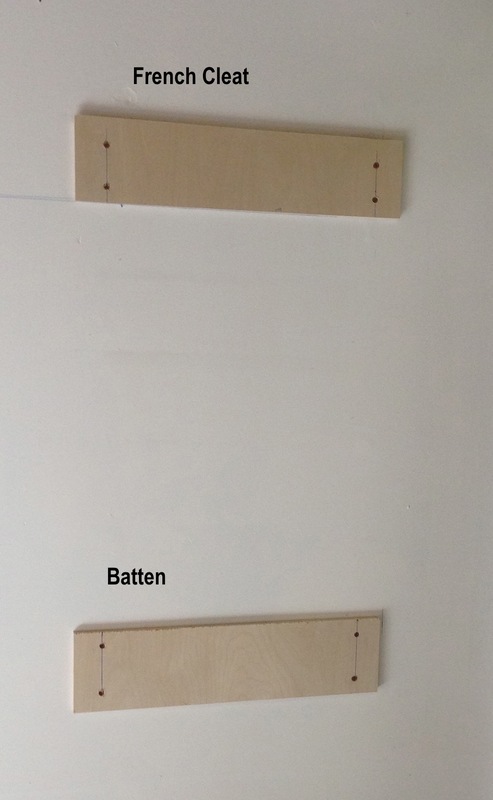 Mounted the french cleat and support batten to the wall – positioned over two studs. 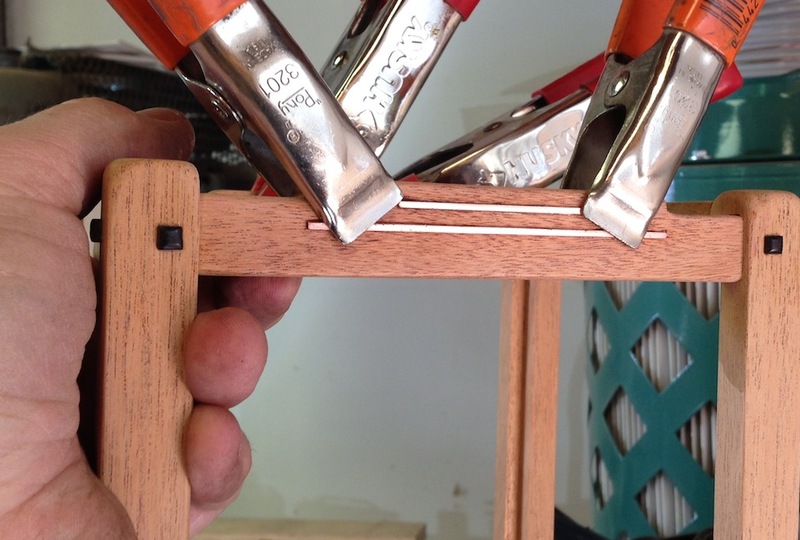 THe lower batten gets two screws through the inside back of the cabinet. Mounting the cabinet is a one-man job like this, just hang it on the cleat and then drive in a couple of screws for insurance. So I had some spare time on my hands today since the glass for my sconce didn’t arrive yesterday. Since I also had some left over plywood I decided to make a cabinet to store my finishing supplies. I’ve noticed that they don’t have a proper home in my wood shop, and I’ve been toting them back and forth from the other shop where I have a place that I store solvents and what not. Not an ideal situation. 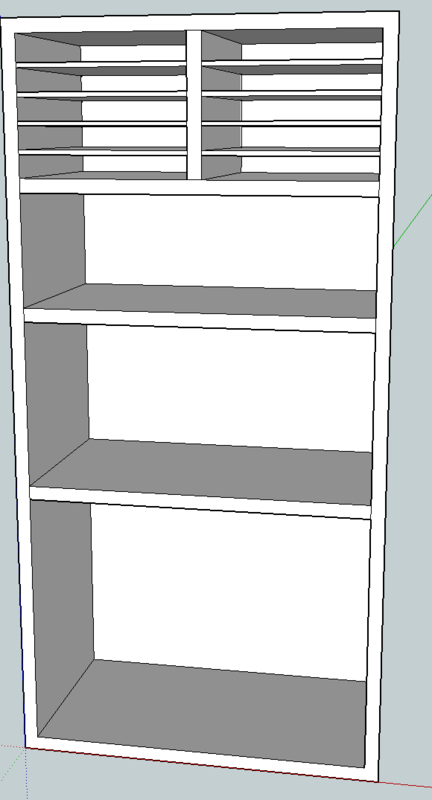 So my “vision” for this, quickly drawn up in sketch up, was a simple cabinet with shelves sized for gallon flat cans, quart flat cans and regular quart cans – as well as some dedicated storage for 9 x 11 sheet sandpaper. I picked through my plywood this morning and decided I had enough leftovers to make this pretty much as I designed it. I cut all the part to size, set up my dado blade and went to town. I only put one dado in the wrong spot, and I don’t think it will show in the finished project. The door is just a flat sheet of 3/4″ ply, in the morning I’ll cut the door, sand the outside and brush on a coat of shellac. I should be able to finish this off in a couple of hours. Its not a thing of beauty, but it will help keep the shop organized. 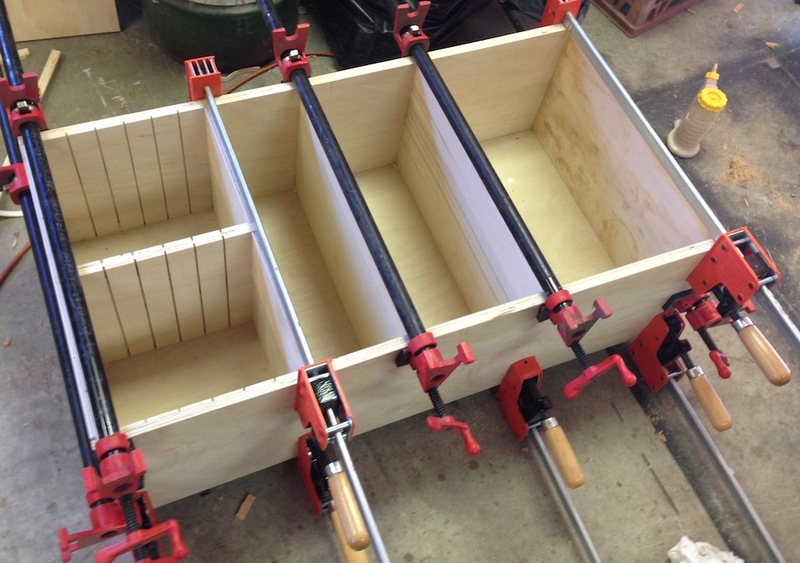 I need a place to drill bits, router bits and power hand tools (router, drill, sander, etc). Not enough plywood left to make another cabinet, so that will have to wait. So I’ve been building up coats of finish on the inglenook sconce, biding my time while waiting for the special glass I ordered to arrive. UPS still says “by end of day today”, but it’s also showing that it’s still in San Pablo, CA. I don’t think it’s going to make it today. Rats, I hate getting delayed. I was sure I’d be finishing the sconce off this weekend. 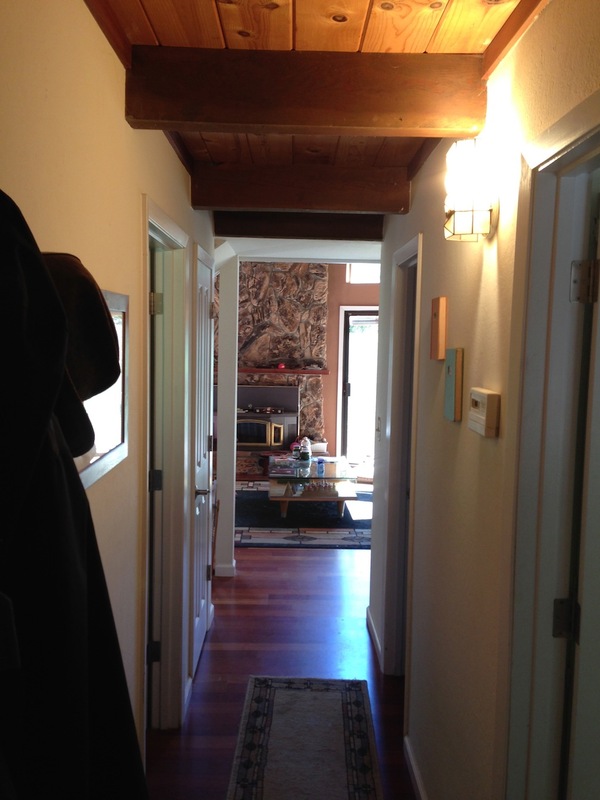 I could paint the hallway where the sconce is going to go, god knows it needs a freshening up. That means a trip to Home Despot in weekend beach traffic. Ugh. I could start another sconce, maybe a second on of these Inglenook sconces. But I don’t have enough Mahogany to make the whole think, and I don’t need a second one. They’re cute though. 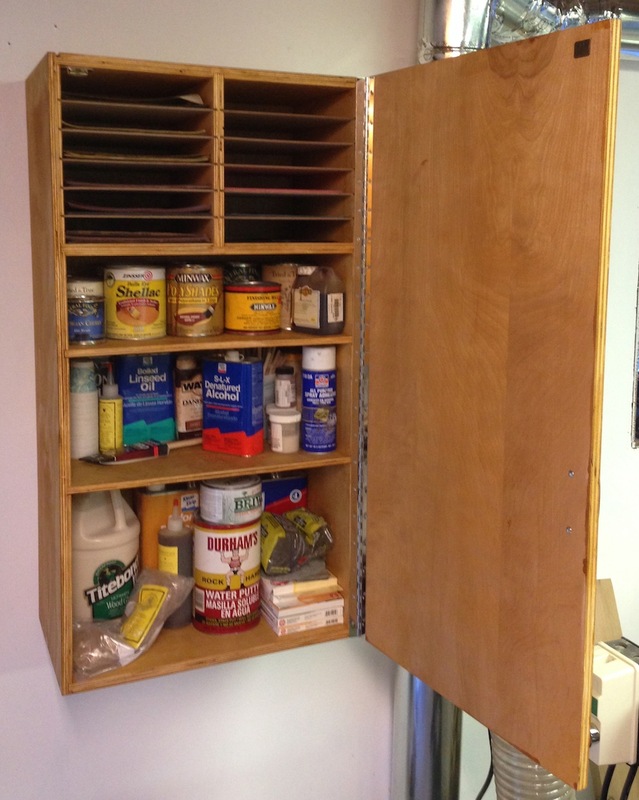 I could make a storage cabinet for the shop, I’ve been wanting a place to put my finishing supplies and sandpaper. I may have enough plywood to make the main part of this, but not the sandpaper shelves. Another trip to the hardware store in weekend beach traffic. 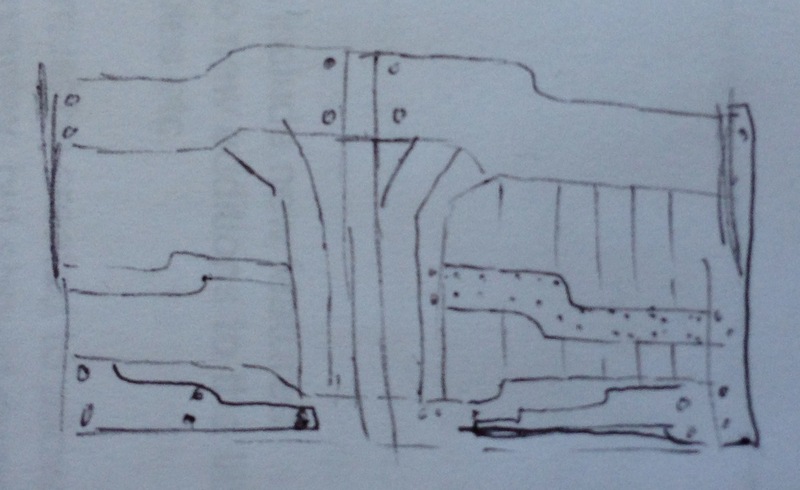 I could spend some time refining the design for the front gate I want to make. Any time here would be an improvement… I should spend some time on this anyway, I want to build this sooner rather than later. I won’t even list the other projects that I have in mind. Too many to think about, but most of these require that I do some design work or go purchase materials first. 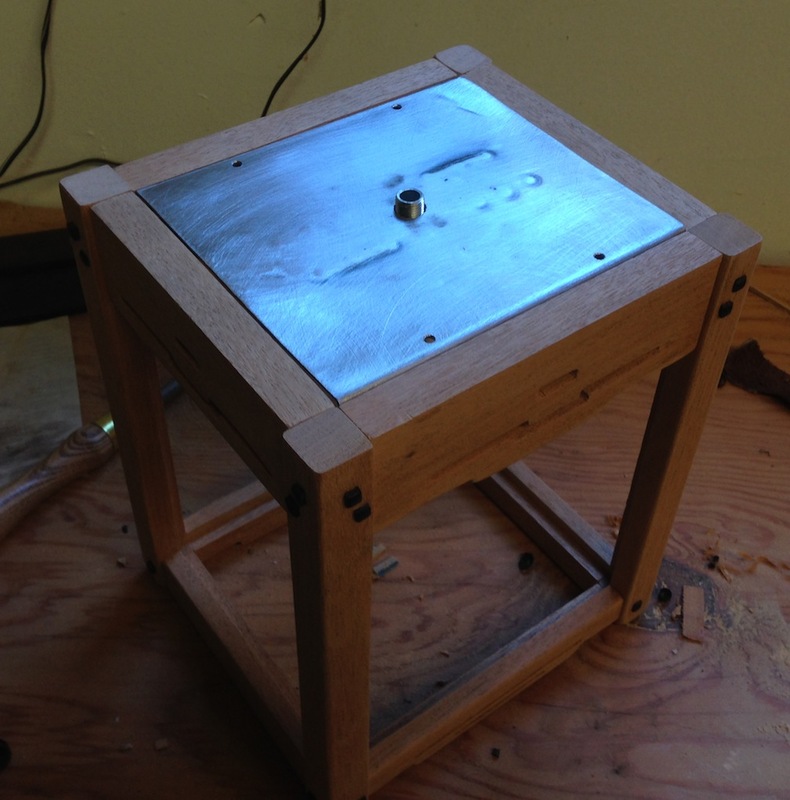 I could also clean up the metalworking shop and make something there. A new kitchen knife? I put the first coats of finish on the sconce tonight. One coat of medium brown dye, and one coat of BLO, rubbed in with 0000 steel wool. It’s a little darker than I’d like, but pretty close to the original finish. I think it will also lighten up a bit as the oil dries. I like the copper inlay bars, it gives it a little “pop” in person. I think the finish is a skosh too dark, but I’ll reserve judgement until it’s done. 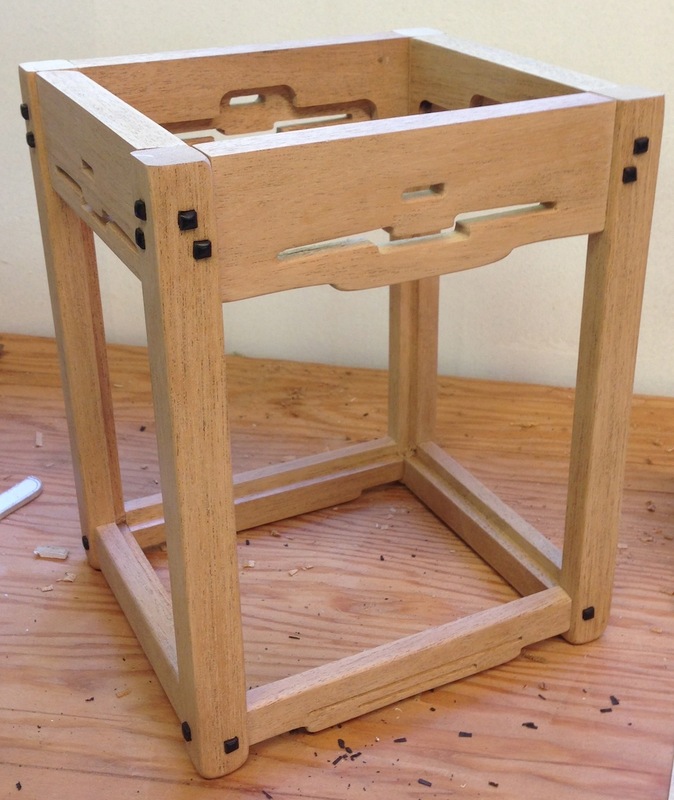 The stiles should be 1/4″ longer on the bottom, and I think I’d add the cloud lift detail on the lower side rails. The Ebony bars are a little too thick, and a little too short. It doesn’t look bad, it’s just not as “identical” as I’d like. 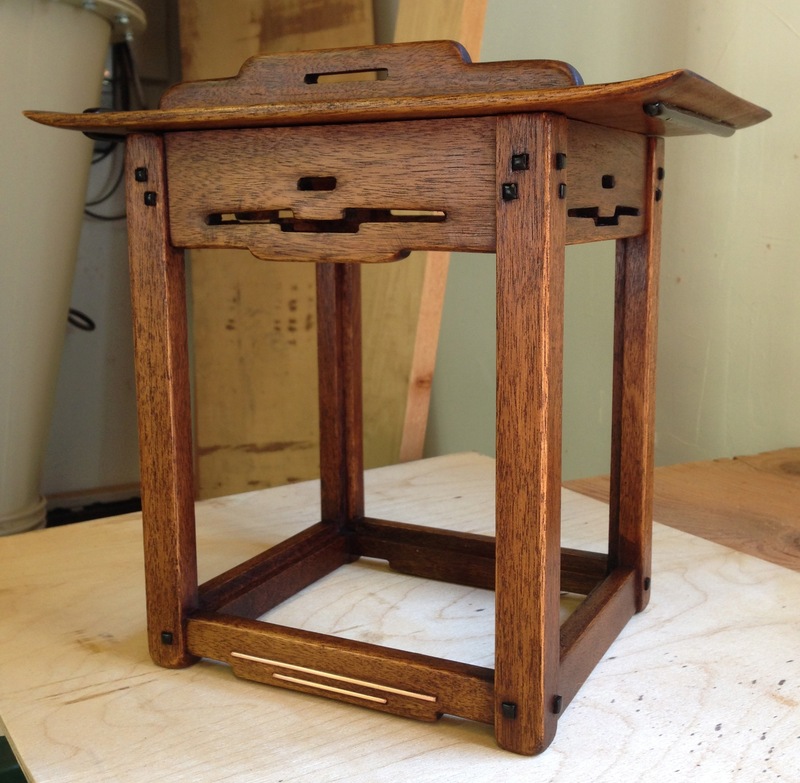 I plan to put two or three coats of Tried & True oil/wax on this and then call it “done”. Any little blotchy spots that remain will get blended in with some steel wool. Next weekend I should be able to get the glass panels made, and wrap this up. 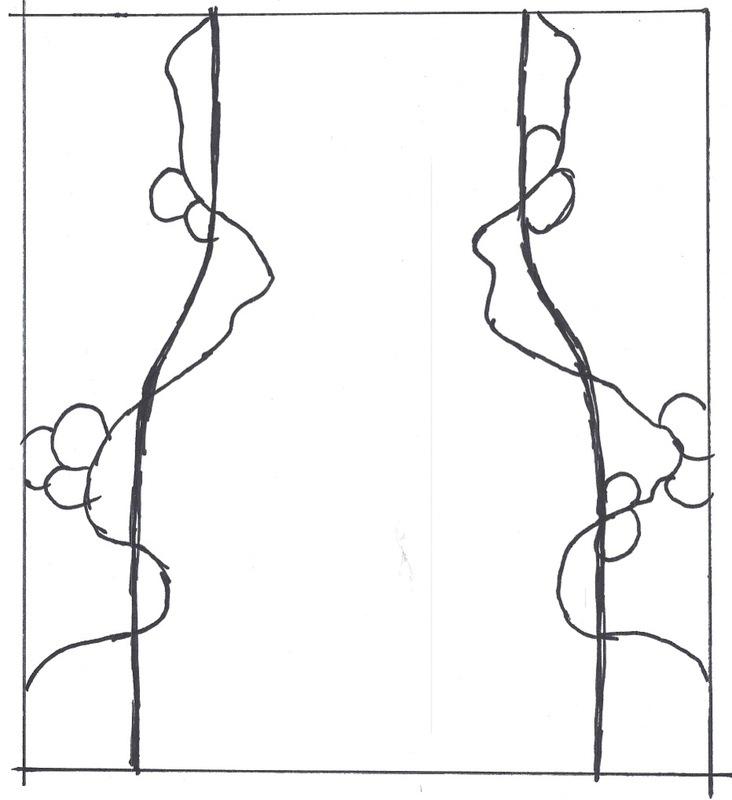 I sketched out the patterns for the glass for the sconce yesterday. I’ll probably fiddle with them a little, looking back at the photos and making some tweaks, but they are reasonable close to the originals. The front and back panels have two slight s-curves that sweep from the wider cloud lift in the lower rail to the narrower cloud lift in the top rail. 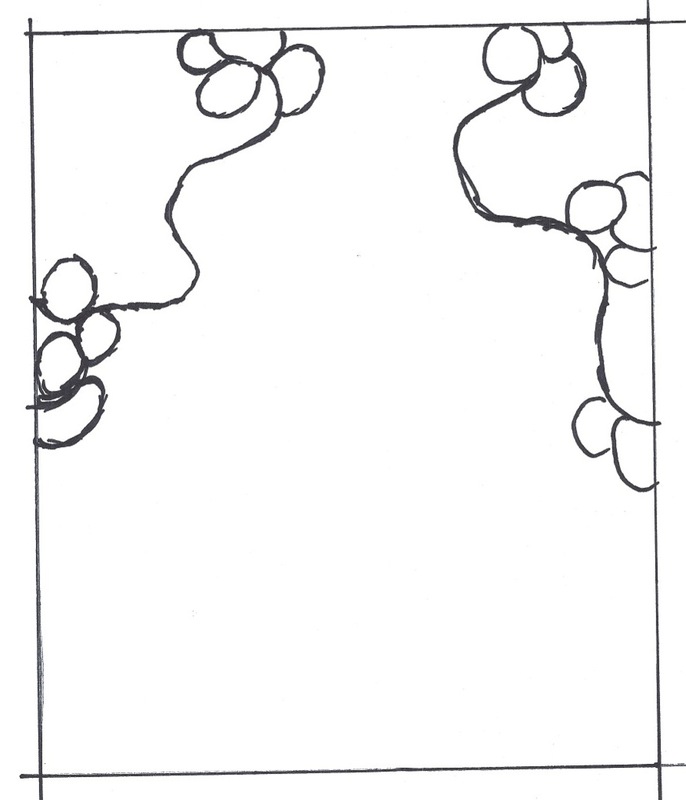 These are overlaid with a crawling vine and berries. Unfortunately I don’t have the glass I want to use for this. I used a medium amber translucent textured glass for the “Blacker Sconces”, which looked nice although it wasn’t the original material. I didn’t have enough of that left to do this one. I thought about using some dark amber that I have, but it just didn’t look right. So I’m going to have to order some more glass before I can proceed. 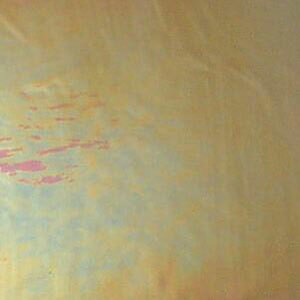 I’m going to get some medium amber translucent iridized, which has a metallic coating that gives it a rainbow effect. To my eye it looks like the entire design in the original was rendered in this material, using slightly different sections where the coating has a different cast for the berries. In some pictures it looks like the cut out in the top rail has a piece of green glass behind it — so I’ll have to experiment and see what looks good. It possible that the original glass colors have faded or muddied slightly after 100 years too, so I’m not opposed to using something slightly brighter. So I put away my tools and swept up the shop in preparation for a week of work, I’m really looking forward to the glass arriving and getting back to work. on this project. I’m still on the fence about the finish. The original has a decidedly brown tone, and I have some medium brown dye that is pretty close. I may use that on it, I’m just concerned about darkening it too much and obscuring the grain. I’ll have to look at my finish samples again before I decide. My 13 year old son had a 7am meet up with a friend to go surfing today (yes, he has a charmed life). Luckily his friend’s parents offered to take the boys to the beach. The upshot is I was up, showered, dressed and caffeinated by 6:45, so I got an early start in the shop. 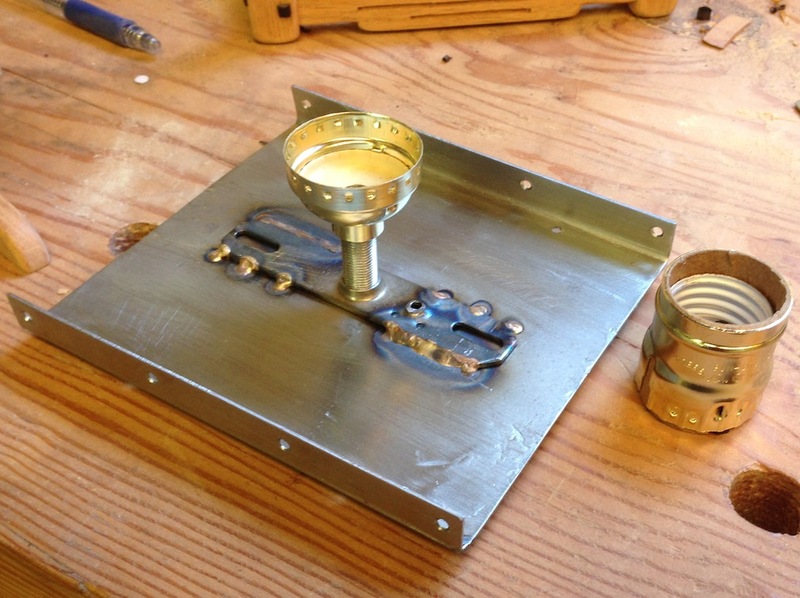 I made a bracket from 18 gauge steel to hold the lamp socket and to tie the sconce body to the lid. No big deal, although I bent the wrong ends on the brake the first time. I probably should have had one more cuppa. Anyway, revision 2 went well. 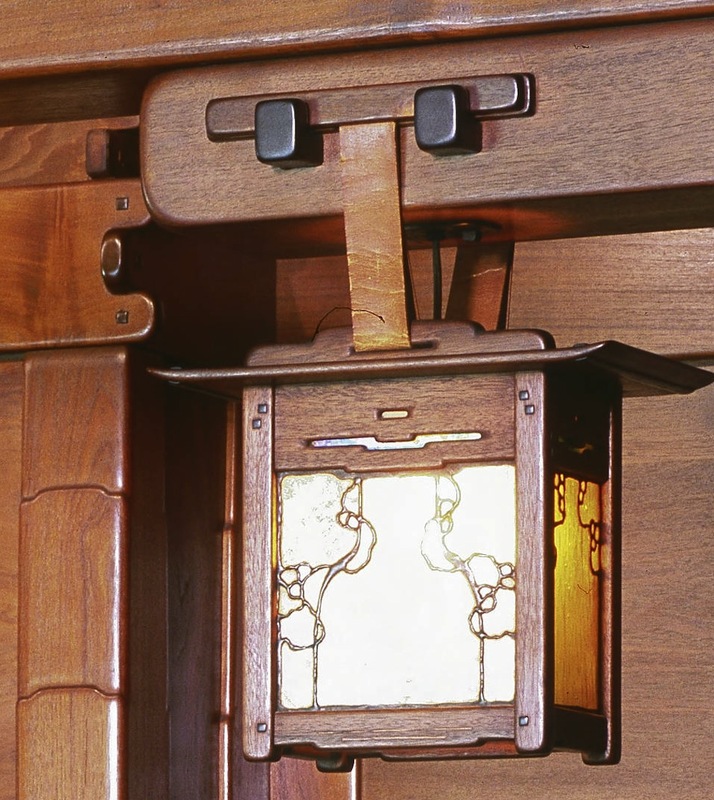 I have holes in the tabs to screw into the top rails on the sconce body, and holes in the other part that line up with the hanging brackets I glued to the lid so I can screw that on. I think I’ll make some sort of decorative nut to go on top of the lid too, to thread onto the threaded stem from the lamp socket. I’d intended to inlay some strips of oak in the grooves I plowed in the bottom rails, but I wasn’t happy with how that was going. Instead I sheared some strips of .065″ thick copper sheet and inlaid those so they are about about .030″ above the surface of the rail. I think that’s going to work out nicely. The ebony bars are glues on, the inlay is glued in and I’m having lunch waiting for everything to dry. I’ll clean up the shop and start on the glass patterns next. I made the top for the new sconce this morning. It was a piece of cake. 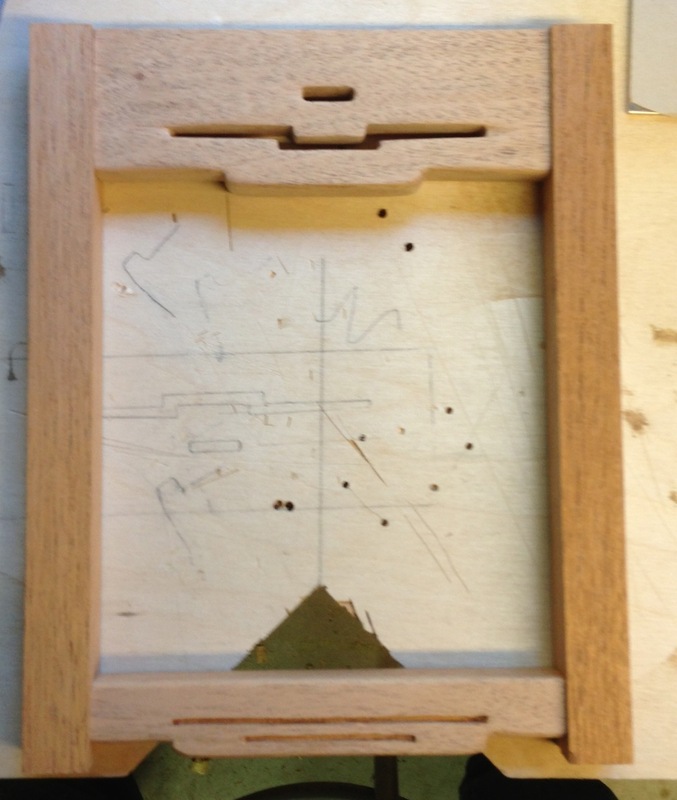 I made a template for the shape, traced it onto the edge of the Mahogany blank and band sawed it as close as I could. Then I did some shaping with rasps, 80 and 100 grit sandpaper, then smoothed it with 220. 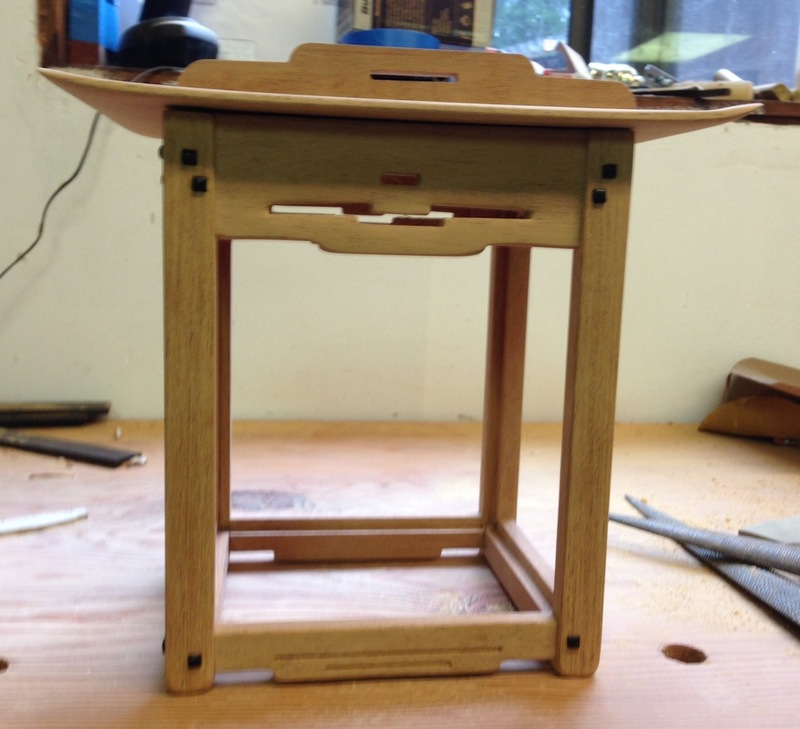 There is a slight cup in the top, but it will pull flat when the top is screwed in place I think. It should work out nicely. I also made the four Ebony bars the go on the top and bottom of the ends of the roof, and I prepared a strip of oak to inlay into the front and back rails. I think the next thing to do is figure out how to mount the light socket and attach the roof, and to install the brackets that hold the leather straps. I should be able to start applying finish on this tomorrow, and start making the patterns for the stained glass. 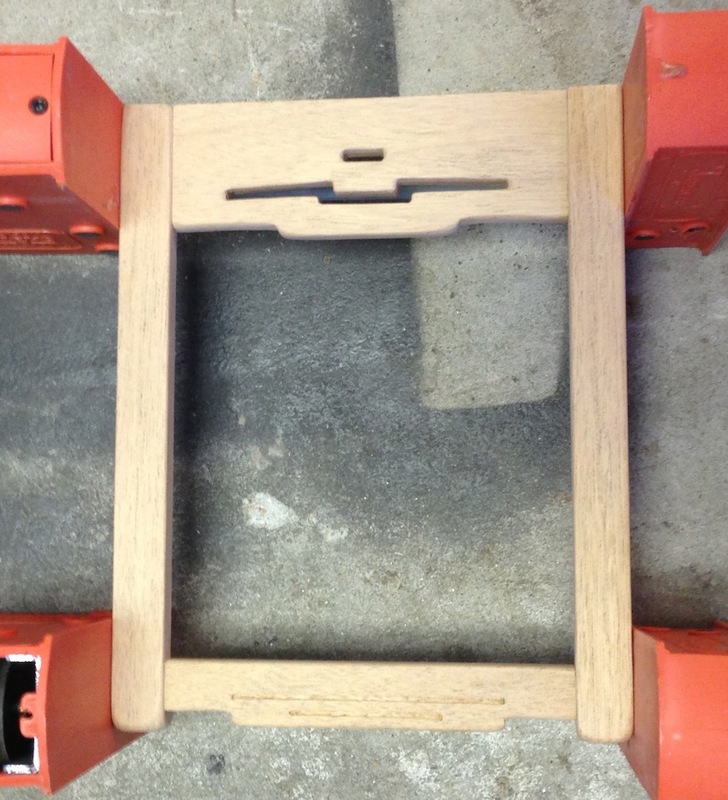 Sconce Body Done, now what? 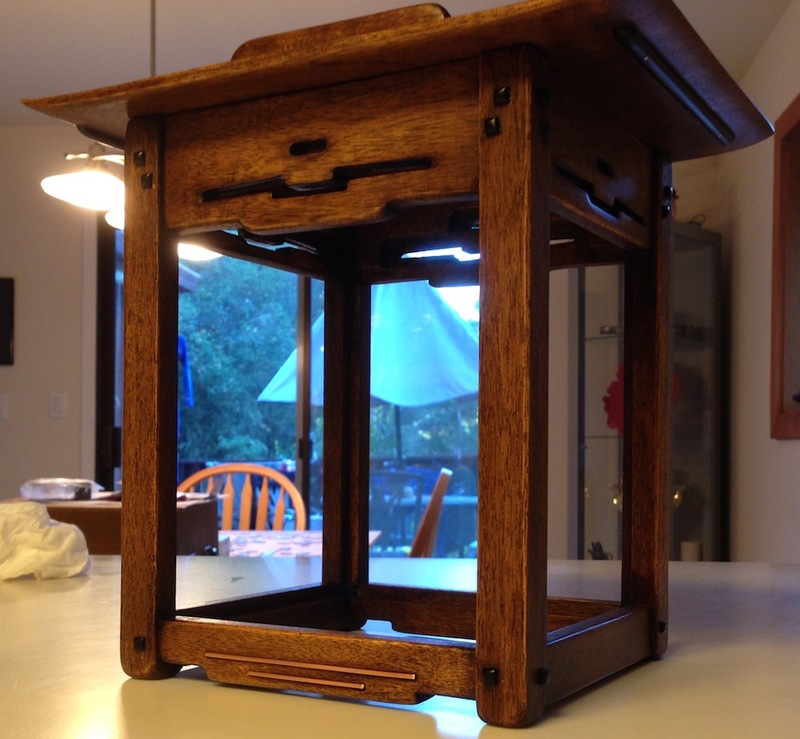 I finished off the body of the “Gamble House Inglenook Sconce” today. I have to make the “lid” or “roof” still, and I have no idea how to do that. Anyone have any suggestions? 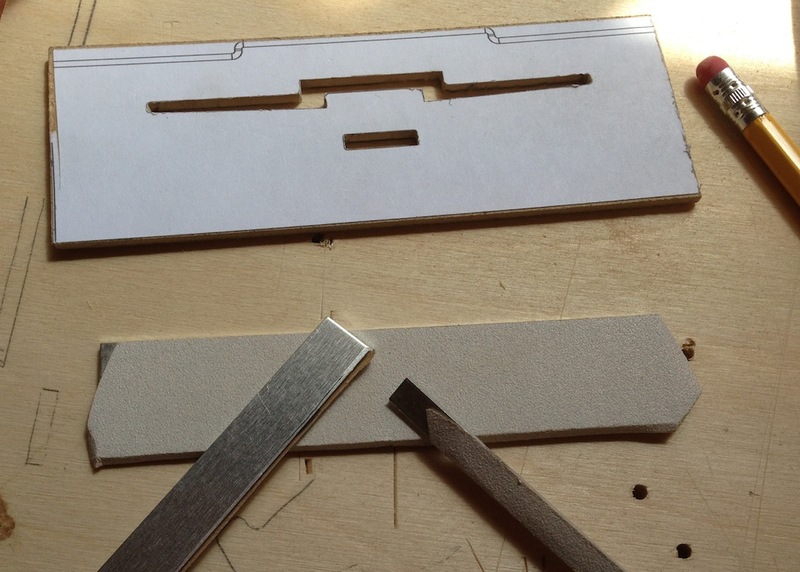 I can bandsaw it close, but I only have a 1″ wide re-saw blade for my bandsaw. I could order a 1/2″ or 3/8″ blade I guess, but it will take a week or two to mail order a custom length blade (I have a WWII era DoAll bandsaw, they don’t have these blades at the local woodcraft store). The top piece is about 7.5″ wide, so I can probably get the cut close enough that I can then sand it into submission from there. I don’t see another practical way to do it. Maybe you could hog out the material using a dado head going across the grain, and just take stepped cuts at the ends. I had a little time today to play in the shop, and I finished the parts for the sconce body. I ended up cutting two of the piercings with my fret saw, and I borrowed a scroll saw from a buddy to do the other two. 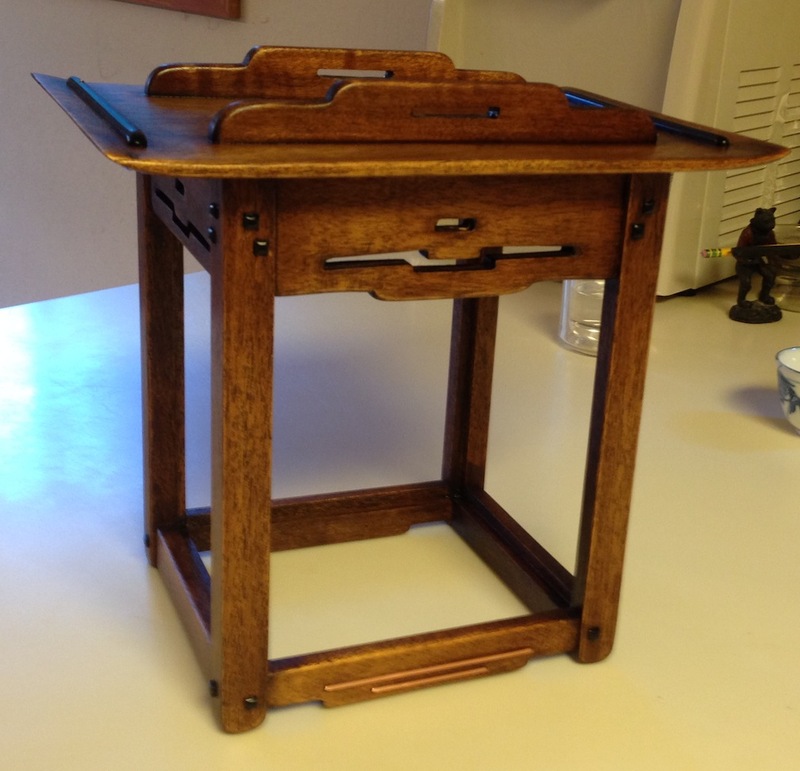 It was faster, with less cleanup, using the scroll saw. 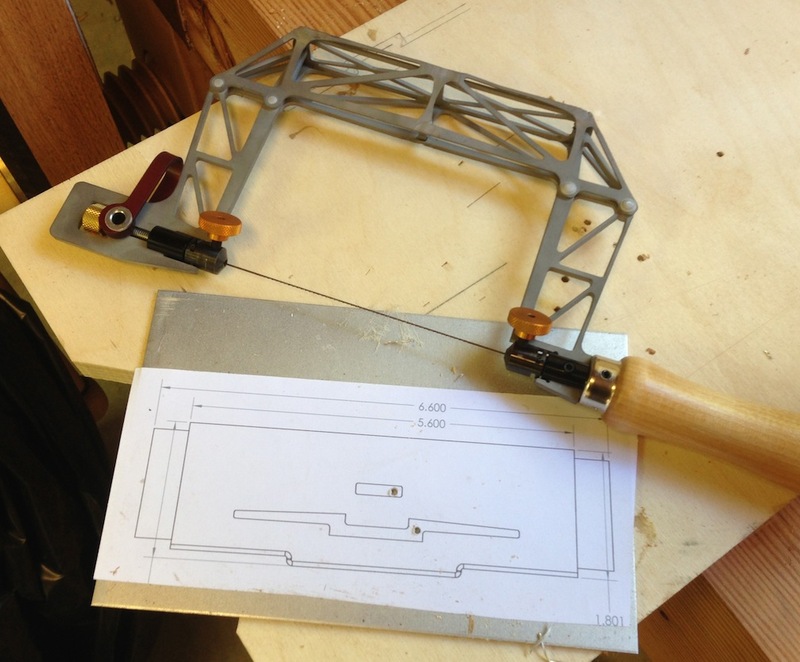 But if I could saw accurately with the hand held fret saw I don’t think it would have been much faster really. Most of the work was clean up with a tiny chisel and my little home made sanding sticks. WIth the scroll saw there was a lot less clean up. 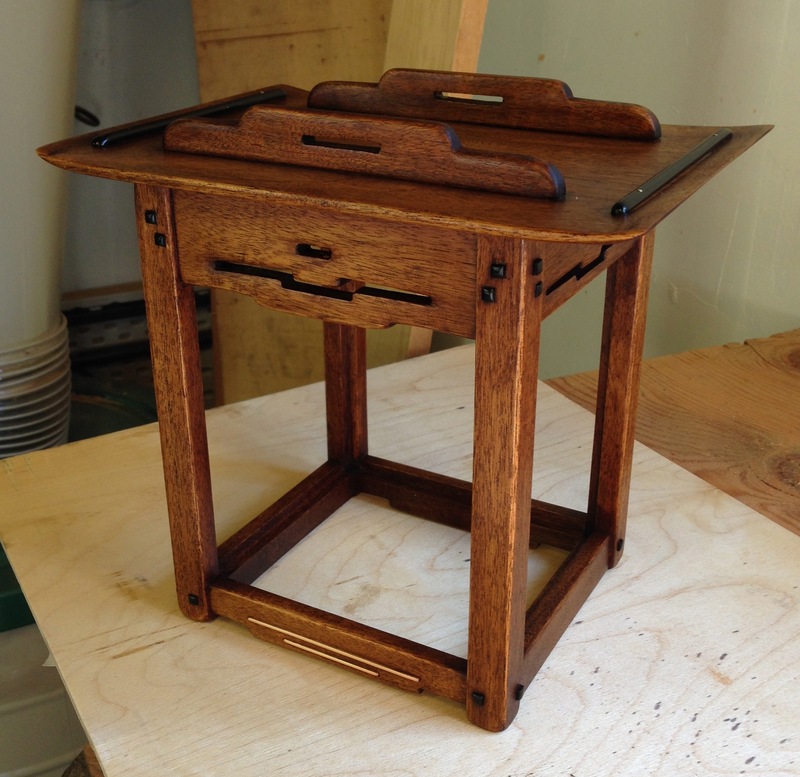 Anyway, I expect a scroll saw is something I might want to add in the future. I want to do some Greene & Greene style inlay, and I’ll need it for that. In any case, I’m starting to glue up the parts for this sconce. 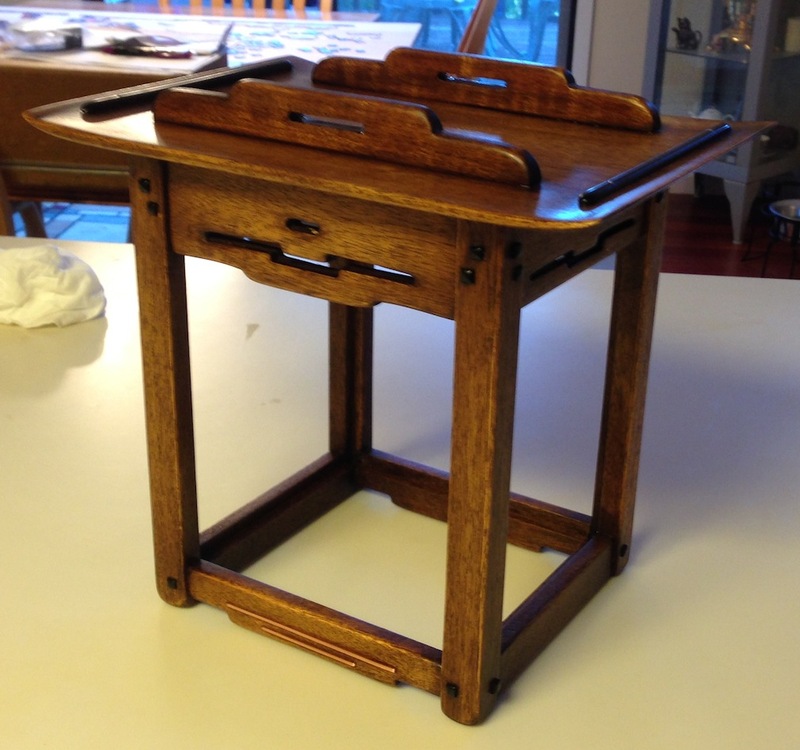 I still need to make the top and the hanger brackets for the leather straps. And the Ebony inlay bits. And the stained glass. Plenty left to keep me busy. I think tomorrow I’ll be able to add the ebony plugs and inlay bars, and glue up the rest of the body. WIth a little luck I’ll bet the rood shaped, although I’m still scratching my head on how to shape that. I hate it when I’m at this point in a project — struggling with some new technique that I’m not very good at. Some days it seems like I’m always doing something for the first time. And sometimes that’s OK, it’s fun to learn new techniques. Sometimes it’s more of a struggle than I like. The specific rock I’m rolling up hill today is the piercing on the sconces. I could make a slot with a small router bit, but I don’t think that would look right. I also am not a huge router fan. 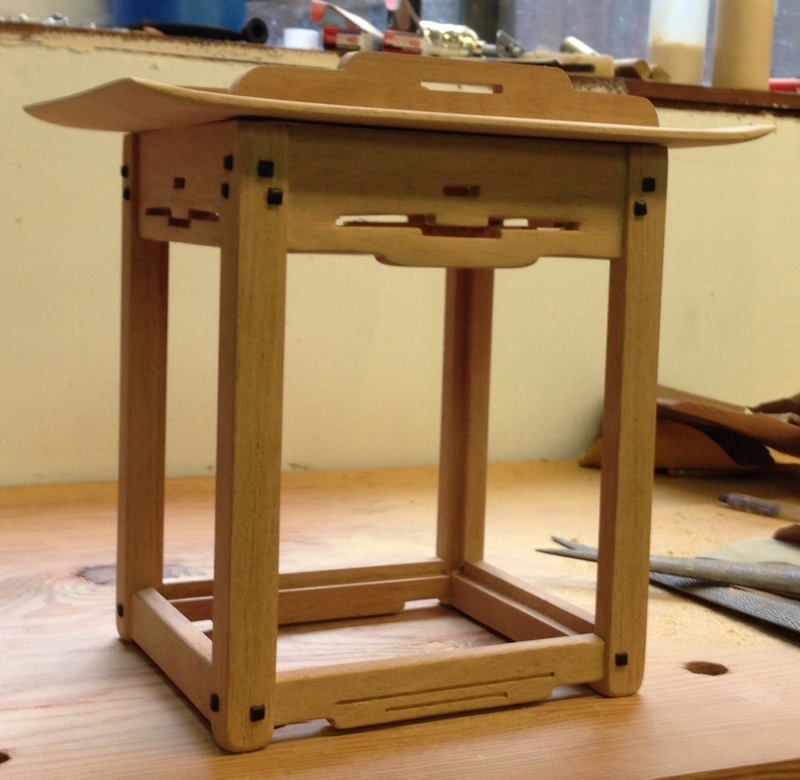 I don’t have a religious objection to them (or to any tool, power or otherwise) but when the solution to any woodworking problem is a router I think it shows in the finished part. 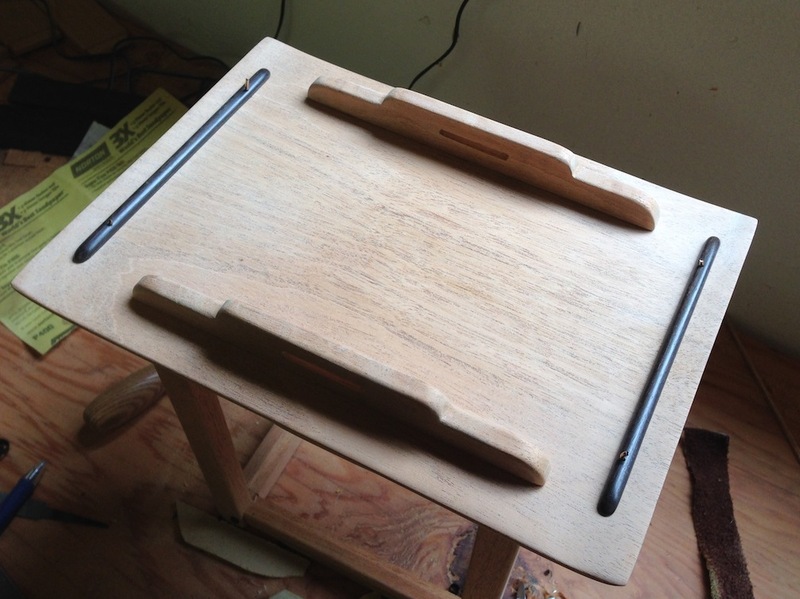 Plus, I really want to be good at hand tool work. So on Friday I called Lee Marshall at Knew Concepts. Lee is an interesting guy, I met him years ago when he was making hydraulic presses for metal smiths with his company “Bonny Doon Engineering”. I’ve wanted one of his fret saws for a while, and this was enough justification to push me over the edge. Here’s a dirty little secret, I can’t saw a straight line with a fret saw. I’ve known this for a long time. I took some Jewelry and metal smithing classes years ago and had a hard time with this then. Lee’s saw helps a bunch, the blade doesn’t deflect or wander like the cheap fret saw I already had. Now it’s all down to me getting my coordination down. 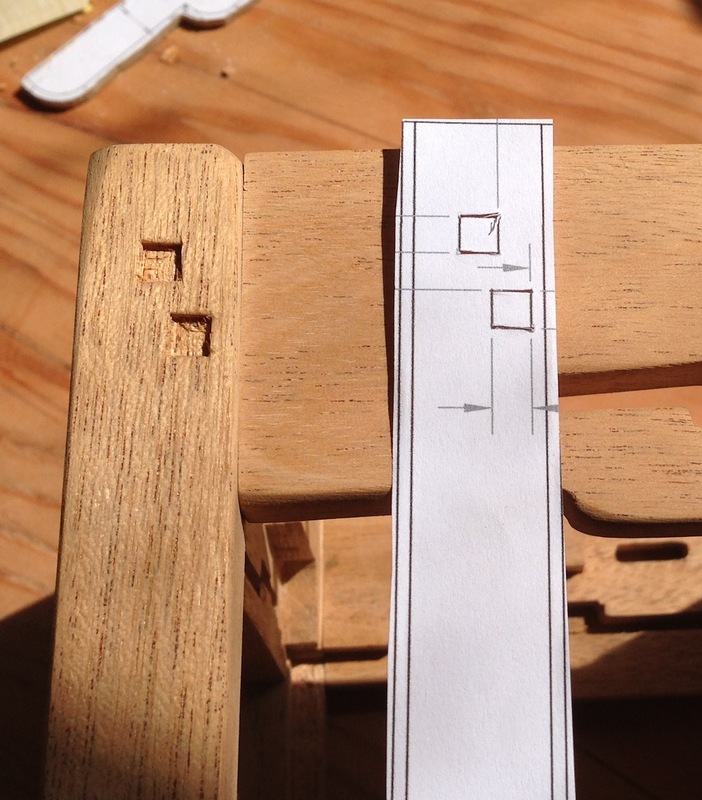 I made a few practice cuts, then sawed out a new pattern based on my updated drawing. I’d like to tell you that I sawed this out right to the line, but I’d be lying. I was reasonable close though, and I used a chisel to trim a few spots. Then I had a small brainstorm and I sheared off some strips of .080″ thick Aluminum sheet, and stuck some PSA sandpaper on one side. It is thin enough to fit into the narrow areas, and stiff enough to hold it’s shape. I was feeling pretty confident at this point. Sawing out the actual rails is a bit tougher. Any tiny variation from holding the saw absolutely vertical and the cut isn’t plumb through the stock. It doesn’t take much of a mistake to be WAAAAY off on the bottom side. 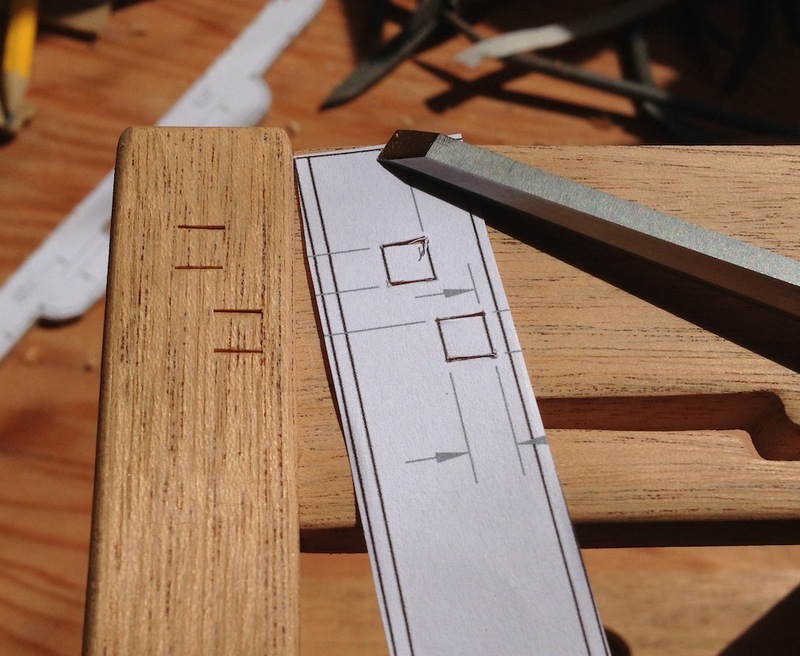 I sawed one rails as close as I could, then used the .080″ thick mortise chisel I made together with the little sandpaper files to clean it up. I also cut the grooves in the lower rail for the inlay. Just three more rails to do the piercing on and I can glue this up. At the rate I’m going that’s probably 3 weeks… Good Grief. I need to pick up the pace here. Maybe I should have bought a scroll saw. Note that I planed down the top faces of the rails so I have more of a shadow line between them and the stiles. I also made a replacement rail for the one I ruined last weekend, and I made several extras. For all of the struggling though, Im very pleased with the results. Maybe after I’ve cut the other three rails I’ll have a better handle on this particular skill, which would make it all worthwhile.